Grace Sturtevant was a singular figure in the early history of iris in the U.S. She was a hybridizer of considerable repute, and an early adopter of scientific methods towards iris breeding. In addition, she was instrumental in the founding of the American Iris Society. Grace Sturtevant was born in Boston in 1865, the daughter of agriculturalist Edward Lewis Sturtevant. Her mother passed away when she was 10, and it fell to her to run the family household and look after her three younger siblings. She had considerable artistic talent, and illustrated her father's records (which were later published as "Sturtevant's Edible Plants" after his death). She hybridized her first iris in 1910, and became seriously interested in iris hybridizing in 1914. 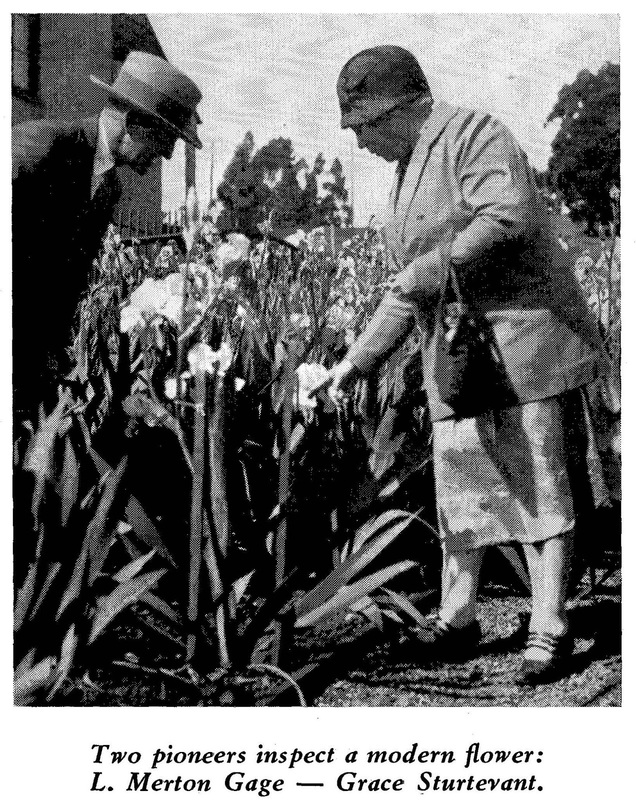 She opened a small nursery, Glen Road Iris Gardens, in 1917. 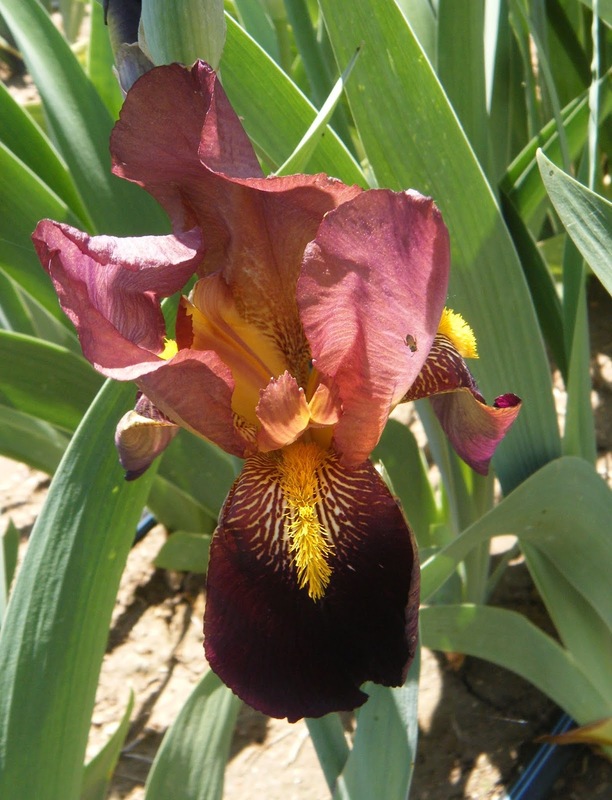 Glen Road Iris Gardens was active until 1932, and in that time she introduced numerous iris, mostly tall bearded iris but also intermediate, miniature dwarf, and Siberian iris. Several of her more notable 1918 introductions include 'Mme. Cheri,' 'Sherbert', and 'Sindjkha'. 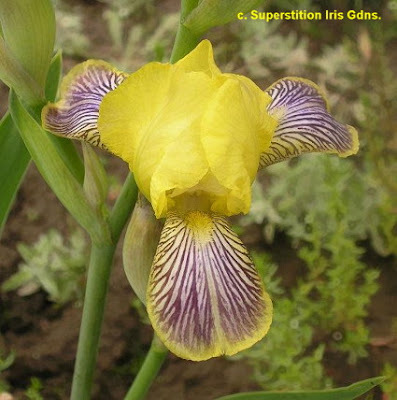 The latter iris is particularly widely distributed, and can be found in numerous gardens. 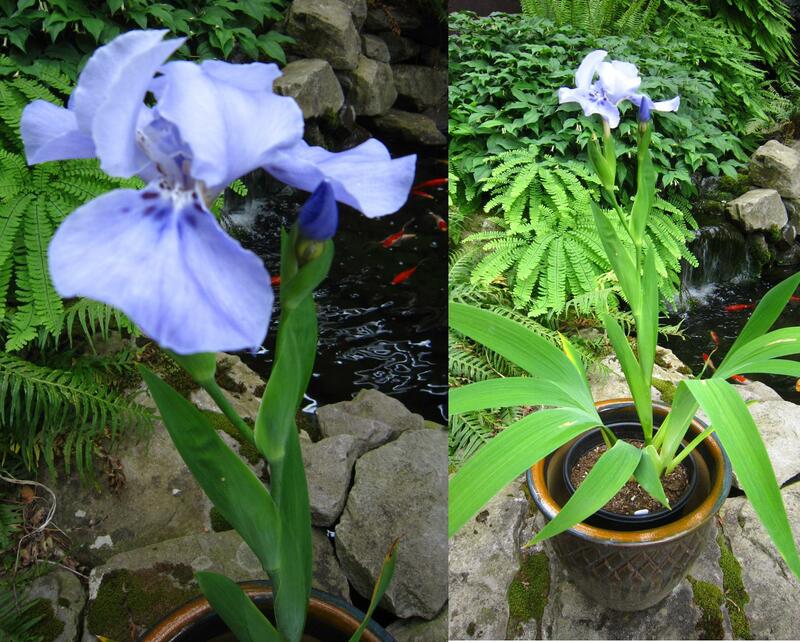 My housemate Gesine Lohr had the experience of rescuing some un-named iris plants from a friend's newly-purchased home - iris that later turned out to be 'Sindjkha'. Much of Grace Sturtevant's philosophy on hybridization can be found in the pages of her Glen Road Iris Gardens catalogs. One particularly notable quote: "The greatest pleasure in life is the recognition of the finest." She was a harsh critic of her own creations, selecting a far smaller percentage of her iris for introduction than was common at the time. Always striving to improve on her introductions, she often in later catalogs urged her customers to discard her earlier varieties as inferior to her more recent ones. 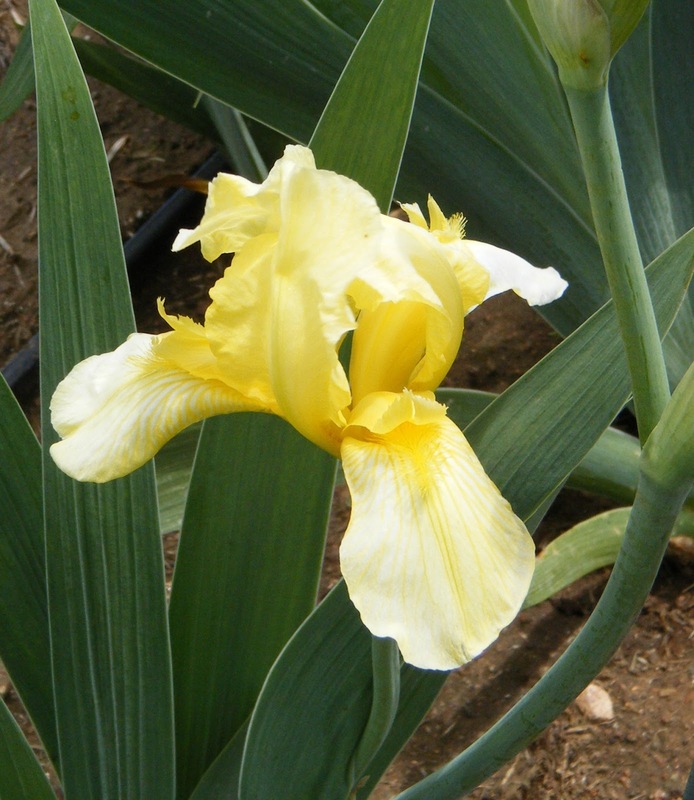 She had a particular interest in yellow iris, and below is one of her best yellow introductions, 'Chalice' from 1924. 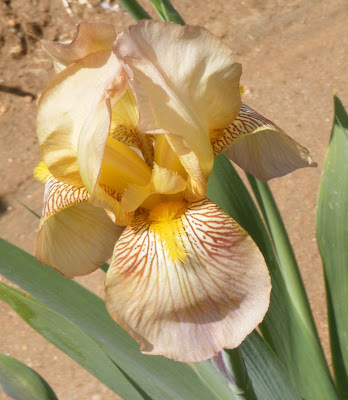 She also had considerable interest in plicata iris, and here is one of her more famous plicatas, 'True Delight', also from 1924. Another quote from her catalog: "Color is the first quality that attracts the attention of the gardener; it is often the last. From the very beginning color has therefore remained foremost in the selection of varieties for introduction." Below are two of her introductions exhibiting unique colors: 'Vishnu' from 1924 and 'Cameliard' from 1927. One of her later introductions, 'Pink Jadu' was a unique color in plicatas in 1932. In addition to her hybridizing activities, Grace Sturtevant was instrumental in the founding of the American Iris Society in 1920, and served in a number of leadership roles early in its existence. 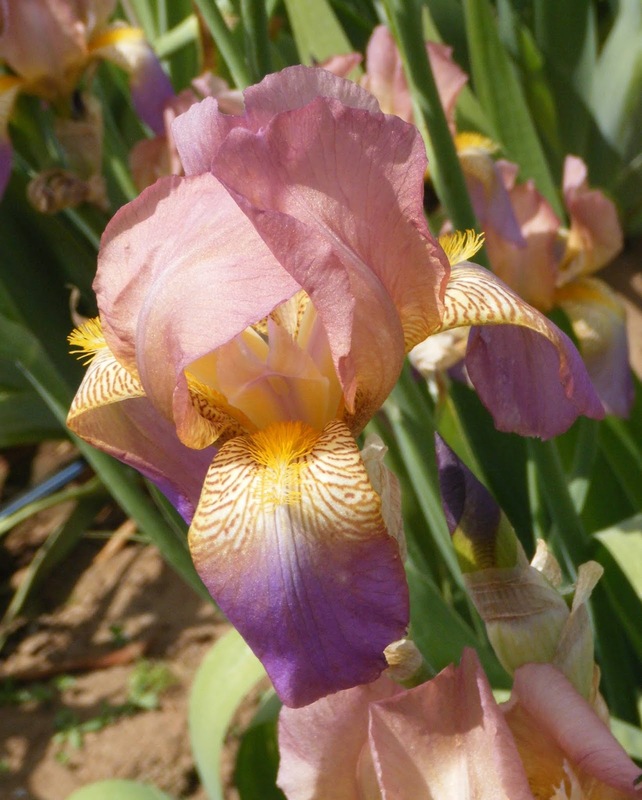 She also received numerous awards for her hybridizing, including the Gold Medal of the Massachusetts Horticultural Society in 1924, the AIS Gold Medal in 1935 and the Foster Memorial Plaque in 1938. 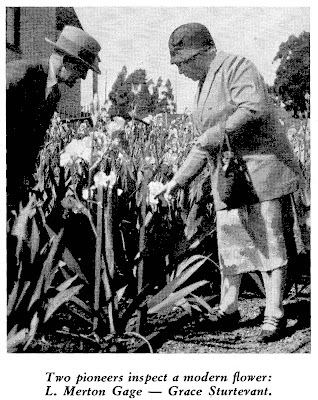 Several years after selling off her iris-growing property due to ill health, Grace Sturtevant passed away in 1947. British hybridizer Arthur Bliss, a close associate of Grace Sturtevant, honored her by naming one of his introductions after her in 1926. My travel companion, Phil Williams, on this saga of California Dreaming, had to be wondering what the fuss is about good food in California. Leaving Bay View Gardens, we had a hasty lunch at a gourmet stop—Panda Express and then it was on the road again, over the Santa Cruz Mountains, through Silicon Valley, over the Mt. Diablo Mountains and towards Merced. Phil received his first dose of real California traffic since the 120 mile trip took over three hours and I considered the traffic to be light. Dropping off the luggage at the Best Western, we decided to gamble that the daylight would last for a trip to Shirley Trio-Probst and Riley Probst’s Fleur de Lis Iris Gardens, Modesto, California. Along the way, we learned a hard lesson—don’t trust the GPS since it insisted on taking us way north and then looping back to Fine Avenue. We arrived on a bad day since one of the dogs had died and Riley and Shirley were just in from a long trip with little sleep, but we were made welcome. Since they grow many reblooming irises and many of the reblooming irises flower early, there was a lot to see. 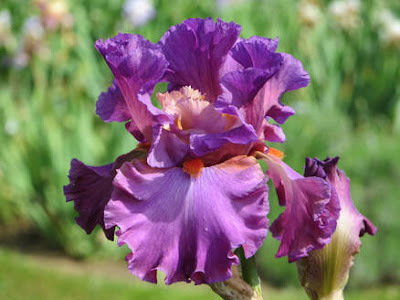 Shirley dabbles in hybridizing and her best known introduction is the Award of Merit winner ‘Opposites’. 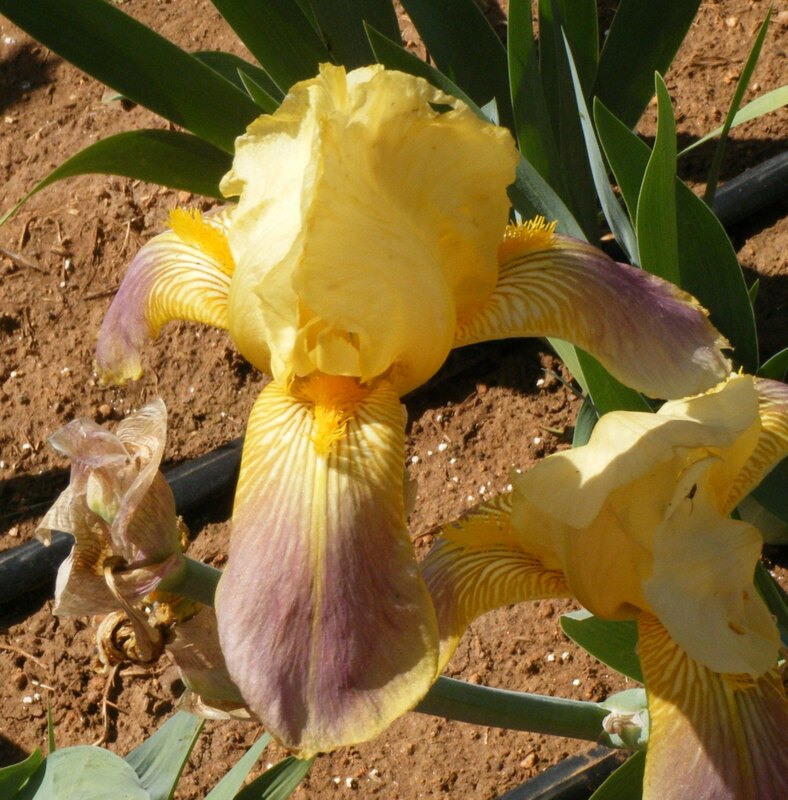 Riley has won the Williamson-White Medal twice for miniature tall bearded irises. Currently ‘Holiday in Mexico’ is very popular and since this was written, won the 2018 Williamson-White Medal. 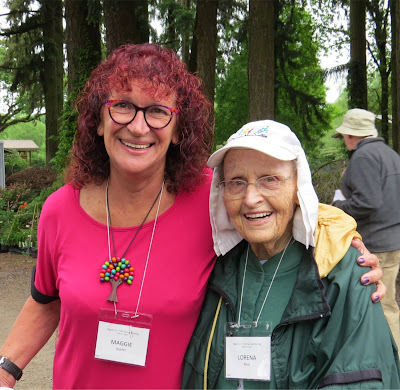 Both Shirley and Riley are deeply involved in planning the 2019 National Convention at San Ramon. Here are some images of flowers I liked in the garden. 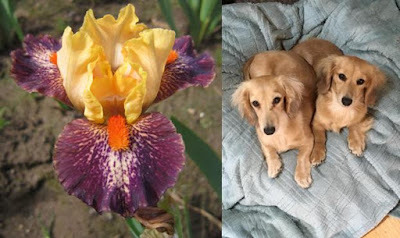 The garden can be contacted at Fleur de Lis Garden, Riley and Shirley Trio Probst, 2701 Fine Ave., Modesto, CA 95355; 209-551-6323 (call first since they might be out visiting gardens); email: rprobst02@earthlink.net, shirleyjtrio@gmail.com. Who will carry our iris hybridizing program into the future? 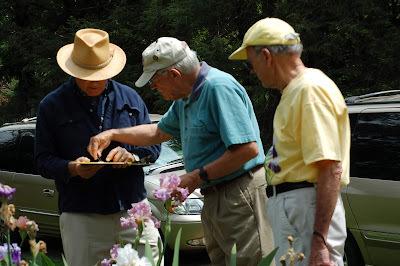 One way we can insure new varieties of irises in the years ahead is to nurture our young members of the American Iris Society and teach them how to hybridize. 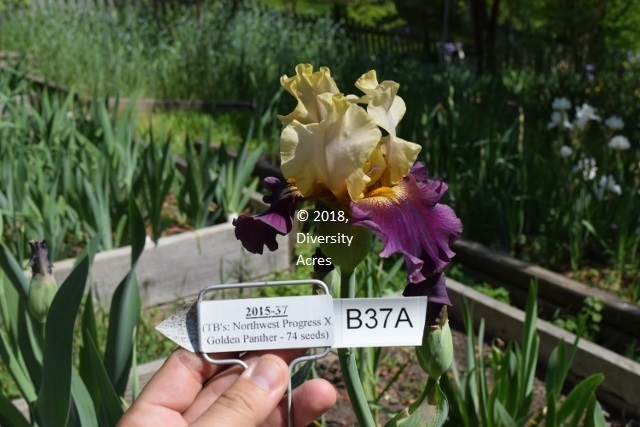 As a retired professor, Don still enjoys teaching, and he finds time to teach anyone who wants to learn to hybridize an iris along with a genetics lesson as well. As you can see, that lesson was well taken. Teaching them to make careful records of their crosses, how to mark the cross and how and when to plant the seeds is also important. Ray and Mac may not be our youngest members, but they inspire others with their enthusiasm to learn. Kristen Laing, who is now 19 years old, became our youngest garden judge in Region 4 at age 12. She also does some hybridizing. Colin became and AIS judge at age 15 and he has been teaching other youth members how to hybridize. He has also registered and introduced his first irises at age 19. 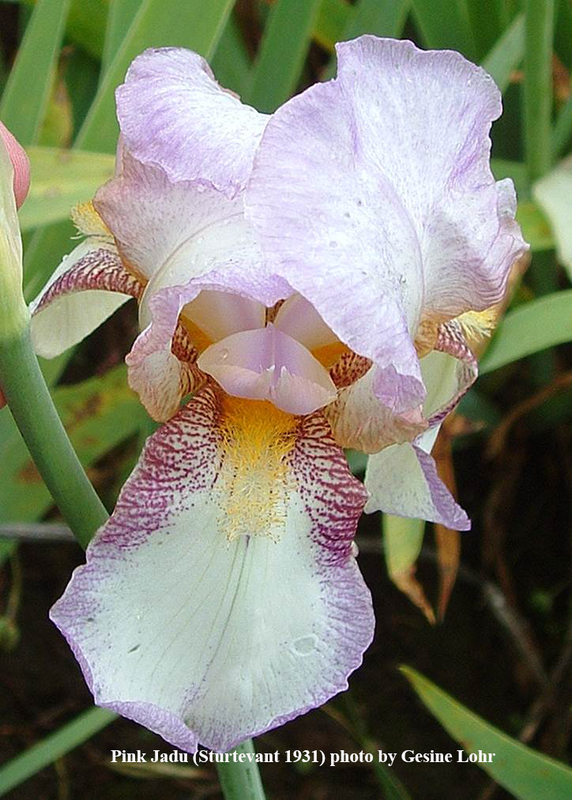 Anyone who has met Colin knows how enthusiastic he is about irises. Ross Eagles came with his family to visit us one day and caught the iris virus. Don taught him a few things about hybridizing and now Ross has his first seedlings. One of them garnered an EC and Best Seedling at the spring show in Fredericksburg, VA.
No matter what your skill, be sure to teach our young people what you know. They can't learn everything on the internet and our world will be all the poorer without the skills being passed along. I guess it is fair to say that my recent trip to Salem, Oregon began in 2017 at the NZ Iris society Convention in Palmerston North where Thomas Johnson was the guest speaker. On a couple of occasions I discussed with him the frustration of working with our “older” cultivars, and he said come over. Didn’t give it much more thought at the time, until early 2018. 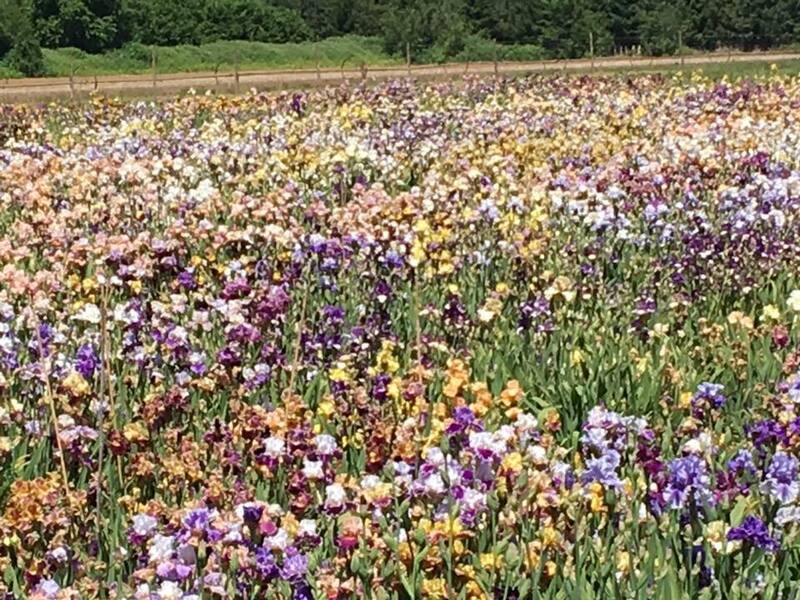 With not much time from when my final decision of “this is what I really want to do”, I was off to Mid America Iris Garden in Salem, Oregon. This was the start of two and a half very busy weeks, mainly spent looking at iris, hybridizing iris, talking iris then more hybridizing iris. Just where does one begin to talk about such an awesome experience? Perhaps the most logical place is the iris. Arriving in early May, the SDB’s were at their best, perhaps some just past their best. Being allowed to walk through the seedlings was just jaw dropping. First year seedlings had your mind spinning, and then to be allowed to play in the second and third year seedling, this is before they have even been introduced was just awe inspiring. At this point, it is fair to say that it was overwhelming, daunting and exciting all at the same time. Without much delay, well a whole day just walking around with my jaw touching the ground and wondering where to start, I pulled out my notebook, my tags and my pencil then got the tweezers in hand we I began. The first few days were mainly spent doing SDB and a few AB crosses. 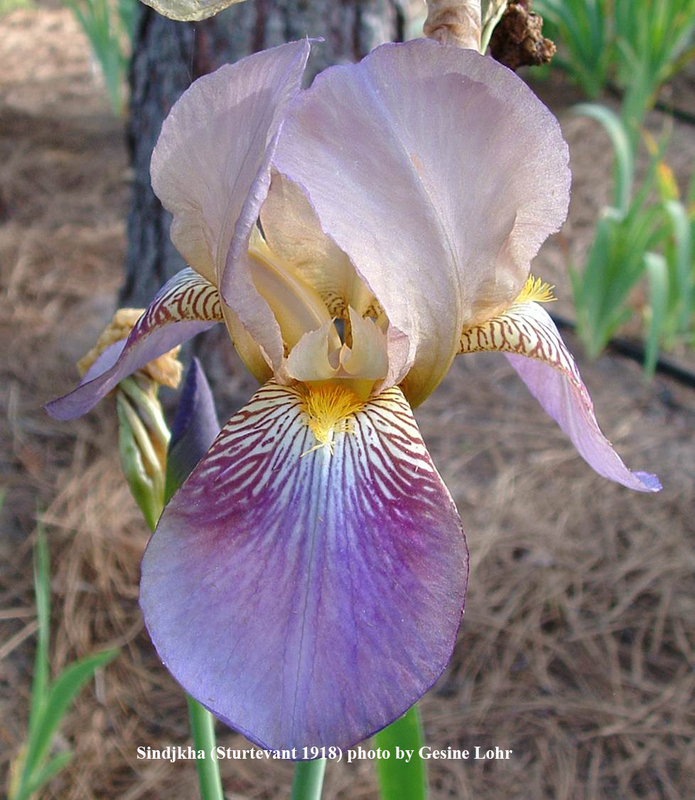 I delightful iris that is named after Thomas and Kirk’s little dashhound (one of two) Alaia caught my eye, but only time will tell if any of the crosses I have done with this one are successful. Once I had gotten through some of the SDB’s the TB’s were starting to come out in full bloom. NOW this was totally overwhelming, just awe inspiring. Questions like – where do you begin, what do you put with what, which garden do you look at first. It was really easy to spend too much time thinking and not enough “just getting on with it”. When you finally get on with it, it is really hard to stop. In fact I did a total of 180 plus crosses and all of them were done twice. Again, just how many were successful, I don’t know yet. The ability to have discussions with internationally renowned hybridisers would have had to been the highlight of my time away. When you have Thomas Johnson, Barry Blyth and Paul Black all standing together, just how could you not be asking questions. And it didn’t matter how strange your question might appear, they were happy to answer. One of my strange questions was – If you had only one flower on a very special iris, could you or would you mix pollen to get as vast a range of crosses as possible. Simple answer really – YES you could, but it would still only be a cross with the pod and pollen parent, just difficult in some cases to know the pollen parent. As the iris has 3 chambers, you could isolate each chamber and have three “proper” crosses. Not such a silly question after all. Before I proceed any further, it must be said that Thomas was more than generous to me. He had four other people staying – Time and Maria Rose Taylor of Riverdale Irises in Vicotria, Australia and mother and son duo Melissa and Bailey Schiller of Smokin Heights Irises in South Australia. It was usually Melissa and Bailey that I got up to mischief with and would visit other nurseries with. We were also very fortunate to spend some special time with Schieners, both in their display gardens and social time. 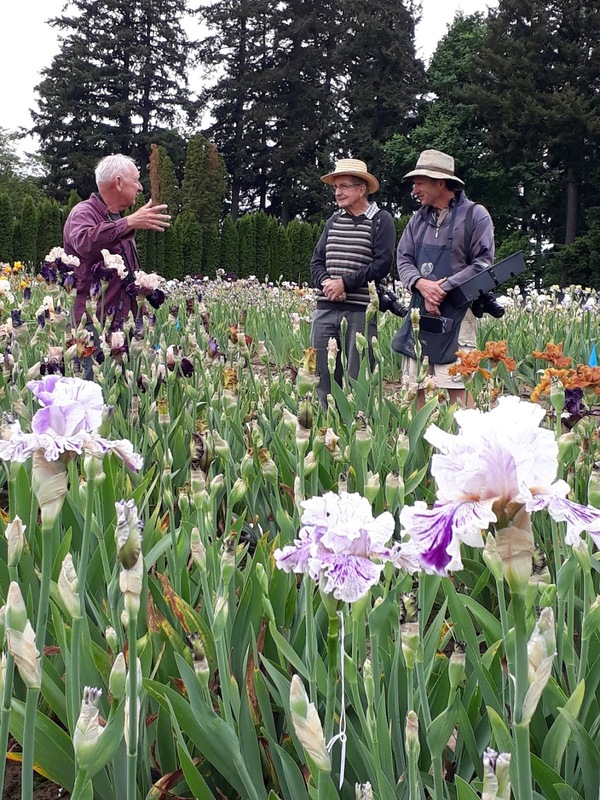 Group at Schreiner's Iris Gardens. 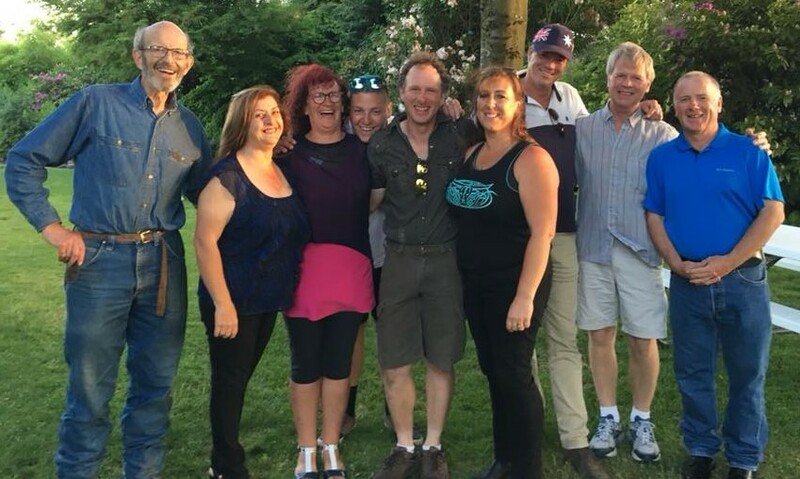 From left, Steve Schreiner, Maria Rosa Taylor (AUS), Maggie Asplet (NZ), Bailey Schiller (AUS), Thomas Johnson, Melissa Schiller (AUS), Michael Barnes (AUS), Kirk Hansen and Tim Taylor (AUS). Another special time, was visiting Keith Keppel in his garden. There he was down on his knees toiling away. Always willing to spend time and talk. 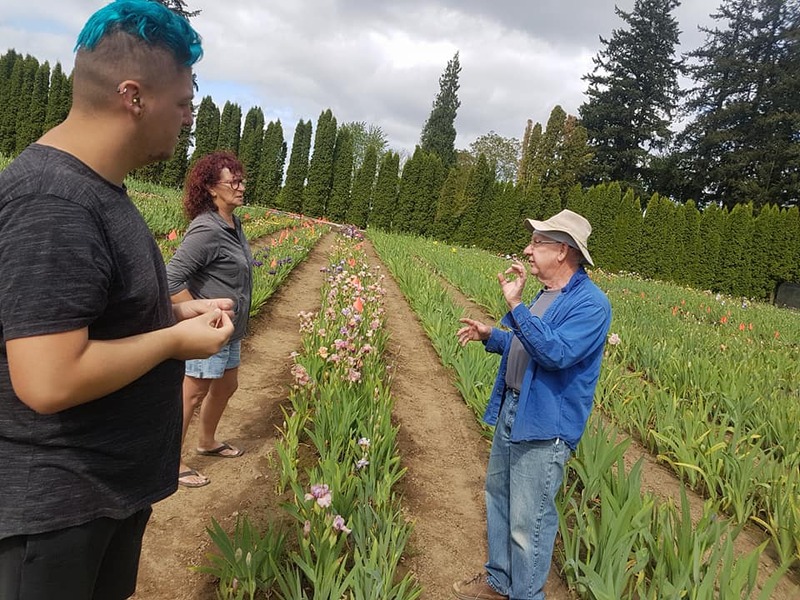 When asked if I could take some blooms back to Mid-America, his very quick response was – “Can I see your breeding programme.” If you didn’t know Keith, you might think he was being serious. Then again perhaps he was? Again, awesome time spent sitting and just talking irises with Keith, Barry, Melissa and Bailey. It made me very aware that there was so much to learn and so little time. 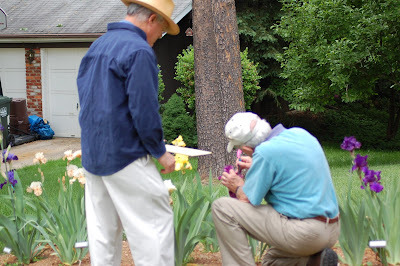 Apart from making numerous crosses, we did have an outing thanks to both Paul Black and Lynda Miller of Miller Manor Irises. Paul was kind enough to take us up to Chad Harris’s place. This was my second visit, as I was there in 2015 at the AIS Convention. 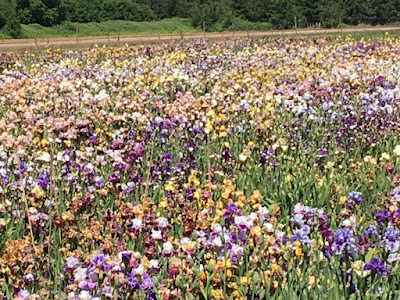 The Siberian irises where in full bloom; just stunning. Perhaps the best was the little treasure that was blooming right when we arrived. 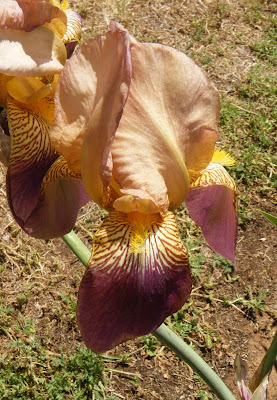 We were escorted straight to look at this particular iris as the bloom only last a short time. 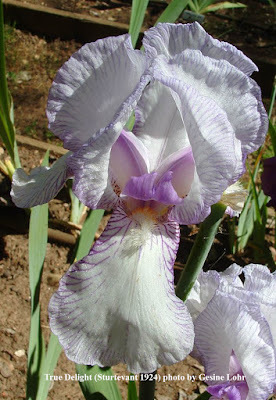 An iris that as yet has not been given a botanical name, and so is currently know by its code name - Azure Iris. 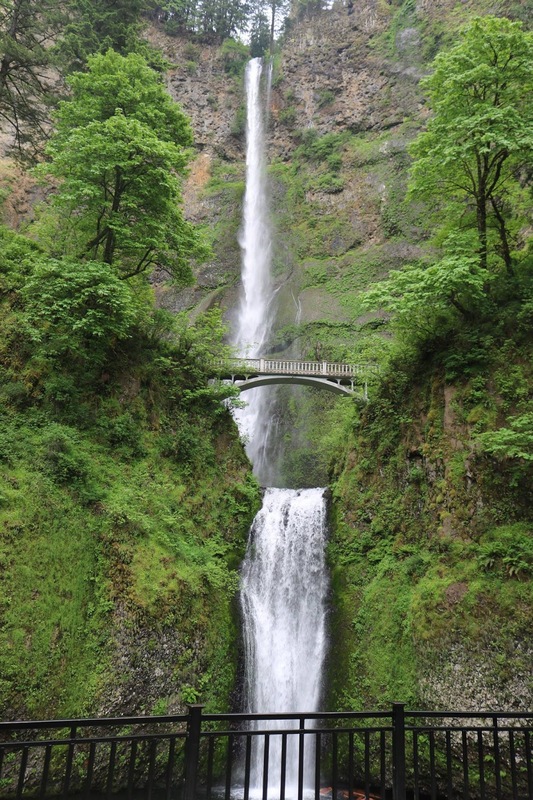 From here, we travelled around to Multnomah Falls. Not as stunning as when the group visited in 2015, but still beautiful. We enjoyed a lovely lunch here thanks to the generosity of Paul Black. From there it was a drive to Paul’s house in Milwaukie, Oregon. 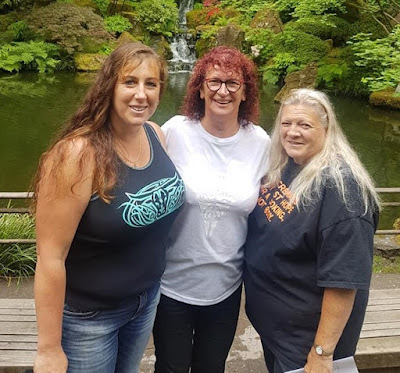 Our second outing was a girls’ affair – Melissa, Lynda and myself to the Japanese Garden and the Rose Gardens. I don’t think you can visit the Japanese Garden too many times, just so much to see, such a peaceful place. Perhaps one of the most treasured time of this trip for me was catching up with Lorena Read. Many of you will remember Lorena as she came and visited us in 2016 for our convention. She was attending the regional meeting and I had enough time to share some special moments with her. Thanks also to Bernard for the awesome photo he took of us both. Bernard will be writing a separate article about the meeting. I now feel like the mantle has been set on my shoulder to make sure that we now have new cultivars for all in New Zealand. It is a long process, as my seed will arrive this year, be germinated in April 2019, planted out in October/November 2019 and may flower for the first time in 2020. It will then take at least two years before there is enough to market. It is now a waiting game. A very special thank you Thomas Johnson and Kirk Hansen, for putting up with me even if I did have you in hysterics at time. Thanks also to Paul Black for your time and willingness to your years of experience. Keith Keppel, Barry Blyth thanks for putting up with me and I will see you all again in May 2019.